A good business is built on its reputation. But reputations are fragile and must be treated with care. The old adage, ‘there’s no such thing as bad publicity’ is no longer true. With the fast moving world of the internet and the viral effects of social media, reputations can be built and lost in minutes. 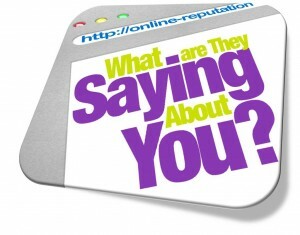 Reputation management therefore, should be an integral part of any company’s internet marketing campaigns. Our reputation manager here at SEO Service Pros has a wealth of experience helping companies build and protect their reputation. Don’t wait until it’s too late. Call us today on 0845 601 2237, or send us a message for advice on your online reputation management. Companies of all sizes can benefit from a reputation building campaign. In a competitive market, it’s not enough just to hope word will spread about your service. A reputation manager works with you utilising tools like PR, social media and blogging to help build your company’s reputation. Established companies with an existing good reputation need to ensure their good standing is maintained. A reputation manager carefully watches any publicity about your company and spends time monitoring social media to ensure your good name is protected. Many companies wait until they have a crisis to call in a reputation manager. In an ideal world, reputation management should be a prevention, not a cure. However, this isn’t always possible. With the viral nature of blogs and social media, you can depend on bad news spreading much more quickly than good. This means any negative publicity must be dealt with quickly and visibly. How does a reputation manager handle damage limitation? With the popularity of online review sites and social media, negative publicity can spread like wildfire, doing serious damage to your company’s reputation. Unless carefully managed, this can and will damage your sales and affect your bottom line. Everyone makes mistakes. That’s a fact of life. Some negative publicity might be unjust, but it must still be dealt with. Complaints can’t be swept under the carpet in the hopes they’ll go away. Because companies have such a visible online presence, your reputation management must be handled publicly too. By responding quickly, and being seen to respond, much negative publicity can be mitigated. Instead of being remembered for getting it wrong, a skilled reputation manager will help turn it around and demonstrate you run an ethical company which takes its customer service seriously. If you need help with your reputation management, get in touch with us today. If you need urgent help with a negative publicity crisis, call 0845 601 2237 now. Our reputation managers will respond quickly and do everything they can to help.